Tac Force Folding Pocket Knife Skull | BUDK.com - Knives & Swords At The Lowest Prices! 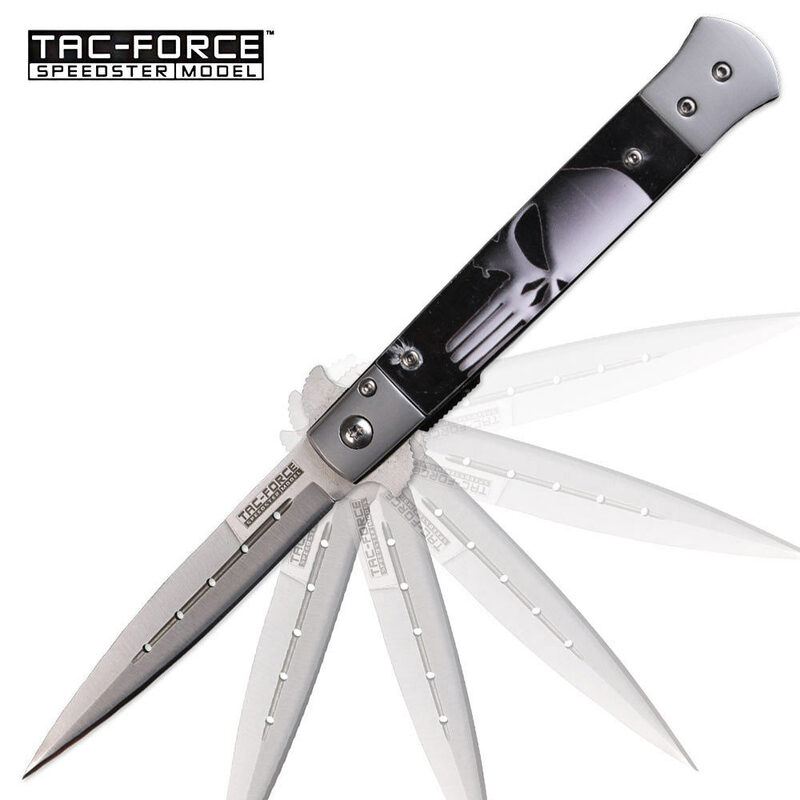 Show everyone your spooky sense of humor with this stylish folding pocket knife from Tac Force. The stainless steel blade is easily accessible with the built-in blade spur. The aluminum handle features an eye-catching skull depiction that will leave people speechless. Clip it to your pocket with the pocket clip. I only bought this because I'm a marvel fan boy...but honestly the punisher thing is just a nice touch...the blade is solid...if you want a stilleto on the cheap. Look no further. Very sharp too. I got this as a Christmas present for my cousin because hes a big punisher fan and being only $10 I did not expect anything great...but I was surprised and happy to find out on arrival this is a very good quality stilleto! Good size, sharp blade, solid construction. I may get another one. Thank you budk! Great knife, Looks good, fast response on the blade very sharp shipping was also fast will buy again and tell others. very nice looking knife. comes out of the box not the sharpest...maybe 5 stars on sharp. all have needed to be adjusted to open properly but once adjusted opens fairly quick. feels like a good quality knife.